Fall is coming! It still feels like summer but I can feel the air slowly getting crisper. Crisp air means crisp apples are ready to be enjoyed. The past weekend I made the trip to Outhouse Orchards to go apple picking. We went early enough in the season that they still had peaches! I now have about 20 apples and 15 peaches that I need to make good use of. With Rosh Hashanah around the corner, I knew I had to make a holiday friendly apple recipe. Rosh Hashanah is the celebration of the Jewish near year with a tradition to eat apples dipped in honey because it symbolizes the sweet year G-d will grant you. For this reason I made the healthiest paleo cake anyone can ever bring to a Rosh Hashanah dinner. Up until now all my recipes on this blog have been vegan. I decided to use eggs in this recipe because in my everyday life I do enjoy eggs. Also eggs improve the flavour and texture of paleo baked goods. Eggs also help bind grain-free flours together to give structure and stability. When purchasing eggs I always buy pasture-raised eggs. These types of eggs are from hens that spend their day on fresh pastures, not cooped up in barns or in cages, allowing the animals to be raised in a humane manner and carry out their natural behaviors. Pastured eggs are also claimed to be better for you with twice the amount of omega 3’s and less saturated fat than a conventional egg. A Free-range egg label can be used if the birds have access to the outdoors, but it does not mean that the birds spend much or if any time outdoors and indoor conditions can be cramped. Pastured eggs will likely be an extra $3-5 and I highly suggest it. This recipe is perfect for those who want to cut down on gluten, grains, and sugar. Flour is replaced by almond and coconut flours. Almond flour is blanched almonds grounded down in to flour. Coconut flour comes from dried and defatted coconut meat that is grounded into flour. The sweetness in this recipe comes from sweet potatoes, apples, and only 1 tablespoon of honey. This recipe can be enjoyed as a dessert or even for breakfast. Hope you enjoy! Preheat the oven to 400°. Prick the sweet potatoes all over with a fork and roast for 30-40 minutes or until very soft. Make sure to place a baking sheet under sweet potatoes to catch drippings. Allow to cool until easy to handle. Discard the skins and place in a blender, food processor, or use an immersion blender to puree until smooth. Measure out 3/4 of a cup for use in recipe. Change oven temperature to 350°. Line both sides of cake pan with parchment paper. Core the apples and slice in to 1/2 cm thick slices. Place in a bowl and toss with fresh lemon juice to prevent browning. Set aside. Combine the sweet potato puree with 1 tbsp honey, coconut oil, and eggs. Blend or whisk until combined. Whisk together the dry ingredients; almond flour, coconut flour, baking soda, cinnamon, cardamom, and salt. Mix the dry ingredients into the wet mixture until just combined. Pour into cake pan and smooth top. 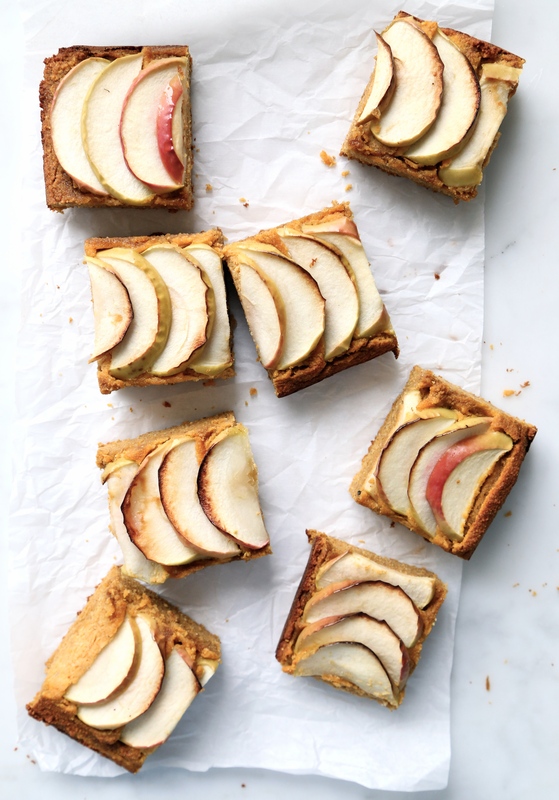 Arrange the apple slices in three vertical lines on top of the cake. Each line should have about 11 apple slices, and each slice should slightly overlaps the other slice. Bake for 30-35 minutes or until a toothpick inserted comes out clean. Allow the cake to cool in the pan for 15 minutes. Remove from pan and transfer to a cooling rack to cool completely. Slice into 9 squares. This entry was posted in Dessert and tagged apples, Baking, gluten-free, holiday, organic, paleo. Bookmark the permalink.